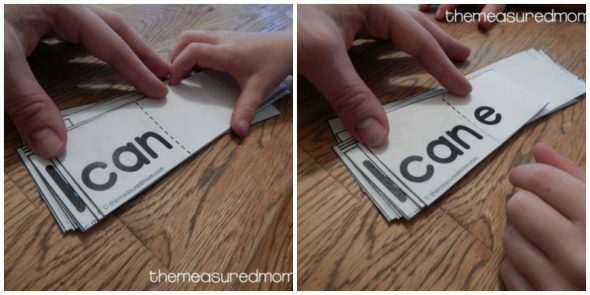 Looking for tips and tricks for teaching magic e words? We’ve got over fifty free printables! 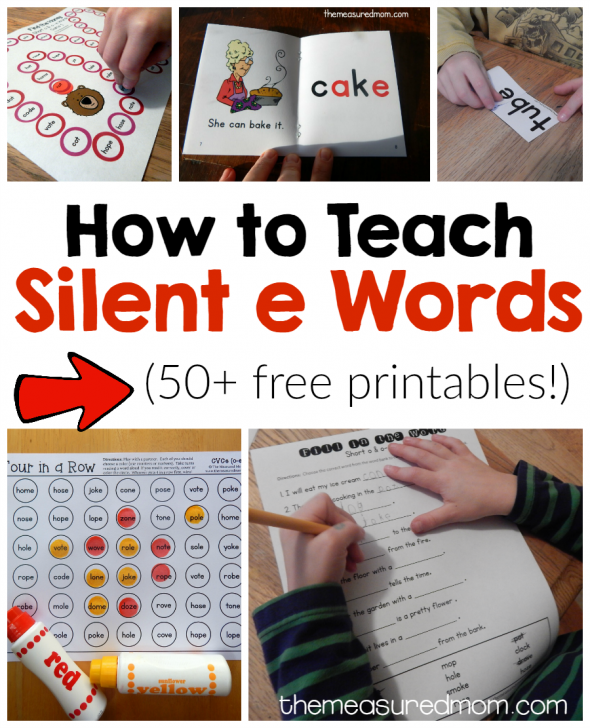 Silent e words, sometimes called magic e words, can throw new readers for a loop. They’ve finally got the hang of CVC words (such as hat) and CCVC words (such as trip), and then we expect them to change up the vowel sounds. How can we help our young readers make sense of magic e words – and have fun at the same time? We like to begin with Fold and Read cards. Your child reads the short vowel word and then folds in the e. The e is”magic” – it changes the sound of the first vowel into its long sound. Our next activity is our Four in a Row reading games. 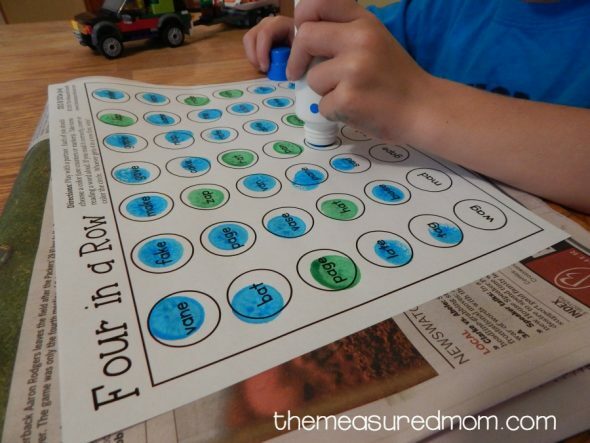 Just grab Do-a-Dot markers (or round counters to cover the words). Take turns reading a word and dotting it. Try to be the first to get four in a row. Even after you have a winner, go ahead and take turns reading and dotting the remaining words. We also play our Follow the Path games. Like the Four in a Row games, these are no prep! Just print and play. Take turns reading the words as you roll the die to move along the path. Finally, I check my son’s understanding with our worksheet packs. He does a few from each pack, depending on his ability and interest. We hope you and your readers enjoy these free resources for teaching magic e words! 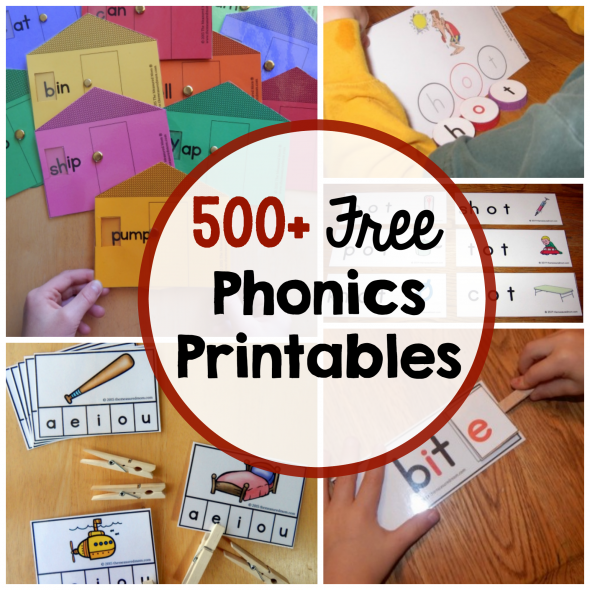 For even more phonics fun, check out our collection of over 500 freebies! Thanks a lot , the worksheets are very suitables and interesting for my students. Please could you help me with games to teach vocabulary for children 7 to 8 years old. 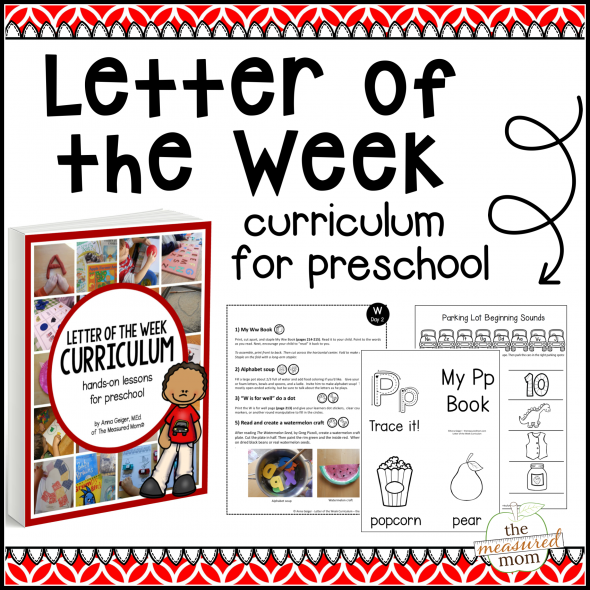 Thank you so much for your fantastic printables. I teach 2nd grade and both my students and my son enjoy using your games & clip cards to practice reading skills, while having fun. Wishing you all the best with your new baby. May your little blessing arrive soon, and may you and your family enjoy a wonderful Christmas. Hi your worksheets are great. 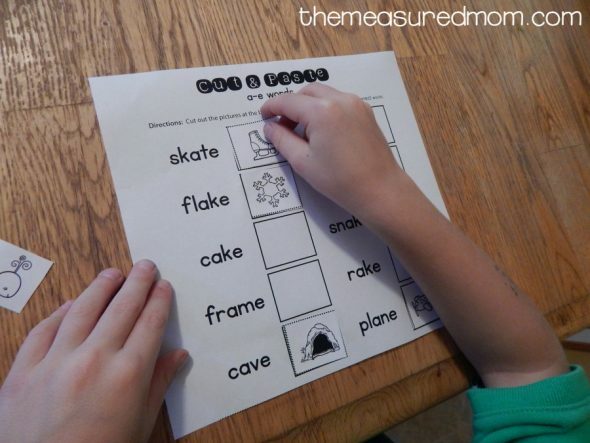 Especially the phonics worksheets and writing printable a. Keep up the good work. Thanks a lot. You’re very welcome – I’m so glad you can use them! Thank you so much! Your printables are amazing! 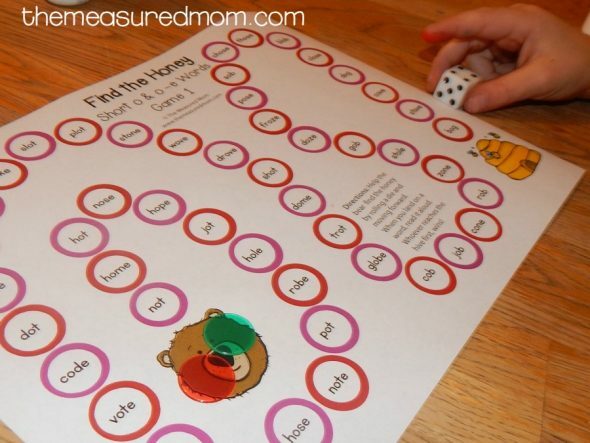 I amusing these with my struggling readers and the improvements that they are making because of the games and worksheets to follow is incredible. Keep up the great work! Anna, thank you, your generosity with resources enables the ” wheel need not be reinvented!! 🙂 A life saver to getting new programmes up & running earlier. I look forward to using your resources to help my mixed grades class become faster readers/ spellers. Yay! So glad to hear that my resources are a time saver for you, Tina! I used the Fold and Read cards and the Four in a Row game with a few of my tutoring students this week. They were a hit and a breakthrough for one student in particular! Thank you for making these resources available and FREE! Yay – thanks so much for passing on your success with the printables, Ashley! That’s so great to hear! This is the best find of a blog that I have come across yet! I am so thankful for all the hard work you have put into this, and even more thankful that you are willing to share it for free! My 1st grade classroom has benefited so much from many of your resources, but especially love the Magic e activities. I can’t say enough good things about this! Thank you!!! I tired this method with a child with learning disabilities and he did so well. Thank so much. That’s so wonderful to hear, Dipti- thank you! I absolutely love your printables, and so do my class. Thank you so much for your generosity in sharing all your hard work. I tutor students that are dyslexic and have used several of your worksheets. What a valuable resource you are! I’m so glad these are working for your students, Ruth! Do you have the magic e booklets that I see printed? I would love to use those in my classroom? Thank you very much. You could be selling on TpT, but I am grateful that these are free. I truly appreciate these freebies – as a special education teacher of K-3, mixed ages, skills and disabilities in my classroom, I am using your materials everywhere all the time. You and your work are truly a blessing. Thanks so much! I’m so glad you can use these, Dolores! I am absolutely thrilled with your website. The activities are awesome and they’re FREE!! I am using them with my grandsons who are in first grade. It makes learning so much fun for them. It is so difficult to find worthwhile activities that hold the interest of children the way yours do! Thank you so much for taking your time to create such an abundance of fantastic activities. Wow. Thank you SO MUCH for these. It can be so hard to find well designed activities that are clear and simple to follow. I am so grateful to you for sharing these — and my kids will be too! I love your printables and your generosity. I’m finding as I find something I would I would to use in my classroom like the magic e word activities, I have to dwell and dwell before I get what you have to offer. Am I overlooking it (which is likely), or what? Thanks so much for your help and your kindness. This is Kate, Anna’s assistant. I’m sorry you’re having trouble! This page we’re on has many different links to magic e activities. Is there one that is not working for you, or is there one you need that you can’t find? Feel free to leave another comment if there is a way I can be of help. I’m not sure which activity you’re having trouble with. Thanks!